Well it is newsletter time already – giving me chance to update you all on our goings on over the last few weeks. I will begin with fundraising and a few thank you’s to be said; firstly a big thank you to Kathrine Haddrell from the Midlands who held a cake sale at her work and raised £26.14p for THHN – what a great and tasty way to raise money! 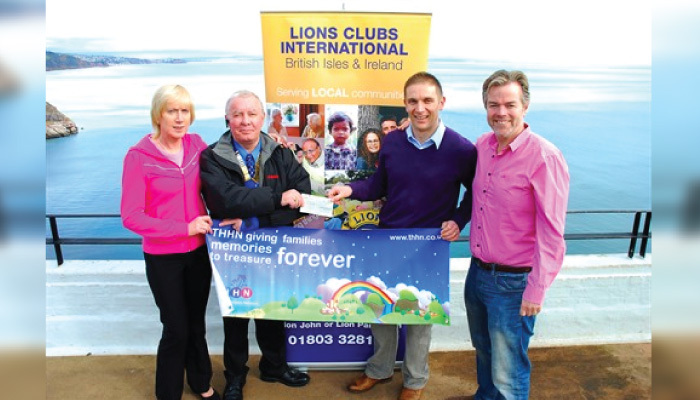 A big thank you to the Lions club of Babbacombe who very kindly presented myself and fellow trustee Martin Brook with a cheque for £250.00 on Babbacombe Downs. A big thank you to the ladies of the Inner Wheel Club of Torquay, who very kindly presented trustee Martin Brook with a cheque for £250.00 at a ceremony last week. Our grants awarding system is now fully up and running – and without the support of very kind people raising funds for us we would not be able to offer this very much needed service! Many of the families who we help are on a single income as one parent has had to quit their job in order to care for a sick child and this has a huge financial impact on a family, not to mention another stress on top of what they are already dealing with. So us awarding grants to cover families travelling expenses really is a huge help to them. If any of you would like to hold a fundraising event for THHN we would love to hear from you or maybe you would like to enter a sponsored run for us, we now have our own stunning running vests that we give to all people running for the charity. For more details please do get in touch. I would like to say a very big thank you to all of you who nominated THHN to be Sainsburys charity of the year in Torquay. We made it to the shortlist of the final three charities and I was invited to make a short presentation to their charity committee earlier this week as were the other two charities. Unfortunately we were not successful but I was very grateful for being given the opportunity. Next comes a very big thank you to long standing THHN supporters Woodlands Leisure Park – who have sponsored some gigantic flutter flags to be made for us to use at our events. They will be arriving shortly – in time for our summer events in the HSBC Marquee on Babbacombe Downs. If you own a business and would like to sponsor any banners, a newsletter (printed version) or any promotional item then we would love to hear from you. I really cannot thank Dave Hanbury enough for putting these two incredible events on for us – as well as supporting the charity by offering free meals for THHN families. Dave’s commitment to the charity is just phenomenal, he has supported us from day one and been a massive help in getting the charity to where it is today! I would also like to thank everyone else involved with these events – especially Martyn Strange of the Babbacombe Inn, Nicky Allen of All The Right Notes, Conway Hoare from the council, all from HSBC community and the St Marychurch branch of HSBC. I would like to say a huge thank you to the Hooper family from Torquay who manage “Faith’s Beach Hut” which is situated on Preston Beach in Paignton. The Hoopers organised for THHN to have its very own beach hut for our families to use whilst on holiday, the hut is fully equipped with all you need for a traditional day out at the seaside – it really has everything, including a cooker! The hut is named after their daughter who they tragically lost to a very rare genetic condition aged just 3 years old. The Hoopers gave the hut a makeover this month with the money that the amazing Hannah Jones donated earlier this year, they purchased new chairs, wetsuits and many other items as well as giving a new coat of paint – and it looks great, as you can see in the picture a THHN family really enjoying having use of it! I would like to thank each and every one of you who sponsored my 40 mile run in the “Keswick to barrow Challenge”, I still have some money coming in but we have raised well over £1,000.00 for the amazing charity Alice’s Escapes set up by my good friends Alice Pyne and her family. The charity operates in a very similar way as THHN but offers holidays in Cumbria. The run was an absolutely incredible experience on so many different levels, it was a true honour to be running as part of the 120 strong “Team Alice” – the biggest team to have entered in the history of the event! I am very proud to say I was the first man home from the team and finished with a time of 6hrs 27min in 63rd position out of 3,000. I will definitely be back next year as part of the incredible “Team Alice” looking to beat my time! Atlantis Holiday Apartments Torquay have helped two families – the first family have a child suffering from Cerebral Palsy and they were referred from Rainbows Children’s Hospice. The second family have a child who is terminally ill with a cancerous brain tumour and was referred from the charity Barnardo’s. Hotel De La Mer in Babbacombe has helped two families – the first family have a child suffering from Cystic Fibrosis and they were referred from the charity Barnardo’s. The second family were a bereaved family and they too were referred from the charity Barnardo’s. Buckfast Abbey self catering holiday homes have helped two families – the first family have a child who is terminally ill with a cancerous brain tumour, they were referred from the Cambridge branch of CLIC Sargent. The second family have a child suffering from an un-diagnosed genetic condition and they were referred from the Rainbow Trust Children’s Charity. The Marine Hotel in Paignton has helped a family with a child suffering from Retinoblastoma who was referred from the Childhood Eye Cancer Trust (CHECT). Vomero Holiday Apartments in Torquay have helped a family who have a child suffering from Leukaemia who were referred from the charity PASIC. New supporters The Abbey Inn in Buckfastleigh helped their first THHN family who have a child suffering from a Metastatic Wilms Tumour who were referred from the Bath branch of CLIC Sargent. I know each and every family had an incredible time and were so very well looked after by their hosts! I really cannot thank all of our supporting businesses for their amazing support – without their support THHN would not exist. We currently have a huge waiting list of families needing holidays through the school summer holidays, so if any of you know of accommodation providers who would like to help please do let them know, as it would be such a shame for us to have to turn families away. Likewise if you know of any business who may have something to offer THHN families – please do spread the word. I will finish by offering my personal thanks to each and every person who has helped us, in the words of trustee Martin Brook – “We are all cogs in the wheel”. Together we continue to grow and make a difference – thank you!